Last weekend was Easter weekend (woo to a 4 day weekend), so who wouldn’t want to make the most of it and plan a little getaway? 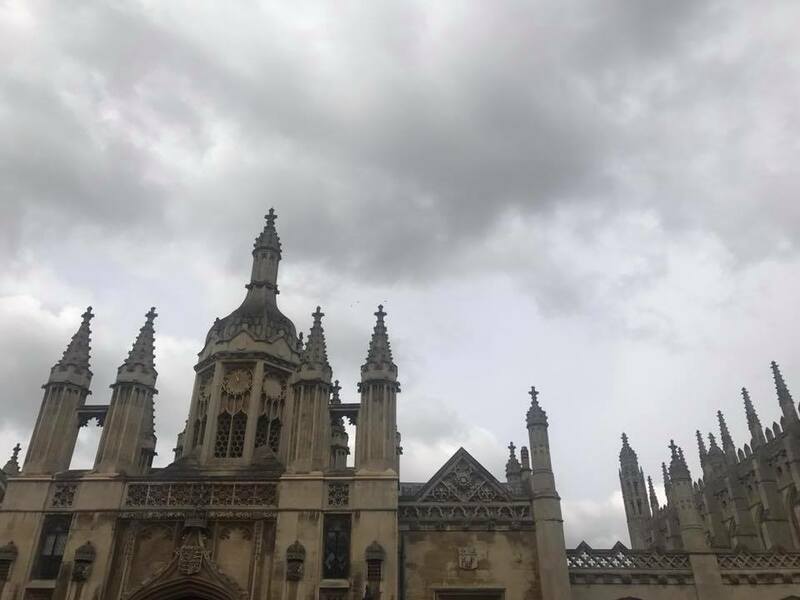 We obviously didn’t go far, but we do love our little trips around the UK and Cambridge has been on our list for a while, and Cambridge is where we went! Friday morning, Good Friday, we woke up as we usually would for work, but that day, we headed straight to the train station and in just less than an hour, we were already in Cambridge. This is where the walking begins, and since we were in no rush, we decided to walk half an hour to the hotel. Once we arrived, we were way too early for check-in but we left our bags and headed for another half an hour walk into the city centre. In every city we visit we always tend to look for independent cafes to visit and en route towards Sticky Beaks we found ourselves in Christ College, where we saw those instagramable flowers (above). After a wonder and a stroll around, we went back on track and found this cute little cafe. James had his usual latte and I, if it’s on the menu, chai latte – that coffee pick me up was so needed with our early start to the day! We hadn’t planned anything for this day apart from lunch, so we took this time to do some research, but in the end, decided to wing it. After walking through the city square and markets, we looked for our lunch destination at Aromi. If you ever find yourself in Cambridge, we would highly recommend this place for brunch, lunch, dinner, you name it. Read more over on our food blog. We finished in good timing as it was time to check in at the hotel. Another half an hour walk back to the hotel it was, with a cheeky pit stop to Patisserie Valerie, getting a cake to share. Whilst in the hotel, we researched on what we could do next. We booked dinner, found a Botanic Garden to visit and somewhere to have a drink. So off we go another half an hour walk..
We walked all the way there to then realise that it was closing in just over half an hour and we had to pay! Pay to get into a garden!?!? It was worth it and to be fair, very understandable that there was a fee to go inside. We didn’t manage to go around the whole of the garden – the cafes and greenhouses were closed, but nevertheless, we had a nice stroll and took lots of pictures and vlogged. Annnnnd we’re back at it again with more walking (okay I promise this is the last mention of walking) and reached Six Rooftop Terrace where we briefly watched the sunset and had a bottle of rose wine to share. It was beginning to get a little bit cold, but it was worth it for the view and atmosphere. Surprisingly there wasn’t many people up there, but we preferred it that way. 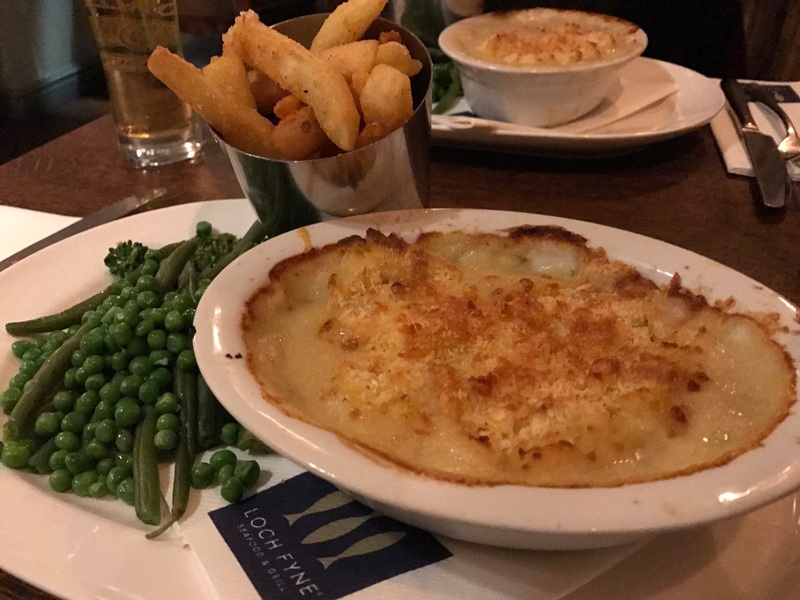 As it was Good Friday, we opted for having dinner at Loch Fyne as they are a fish based restaurant. 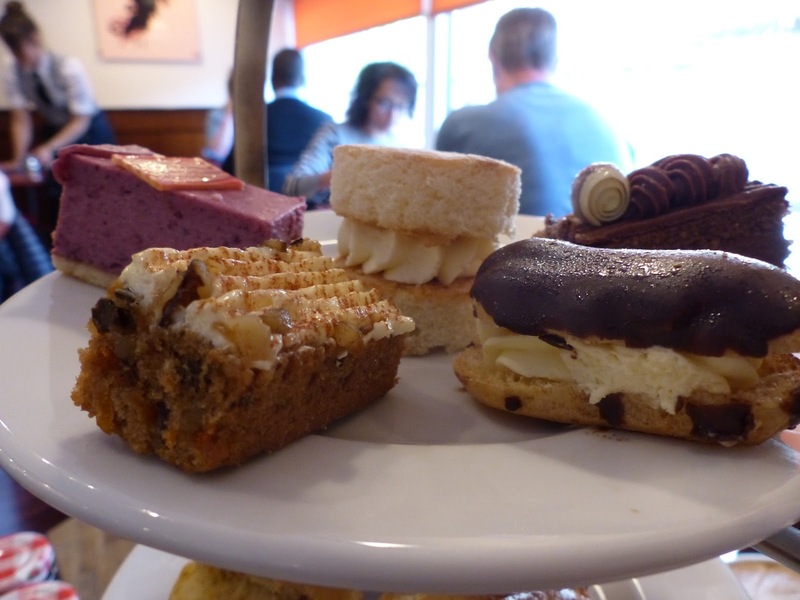 Again, you can read all about it over on our food blog. Next morning, now Saturday, we woke up reasonably early, got ready and checked out of the hotel, leaving our bags there. James had booked us for a free 2 hour walking tour in Cambridge with Footprint Tours, and this would be our first stop at 11am. Just before the tour, we had 15 minutes to spare, we just couldn’t help but go to Aromi again for some brunch and coffee. In my case a pistachio hot chocolate (it was heaven) as the meeting point was just around the corner from there. It was such an informative tour, filled with much knowledge and banter with our guide. Although this was a free tour, their commission is based on tips and it was good to see everyone give generously! It was so well organised and very personal – the guide are actually students in Cambridge. After a quick meal deal lunch, we were off to our next destination, and what we were building up to be the highlight of our visit here. 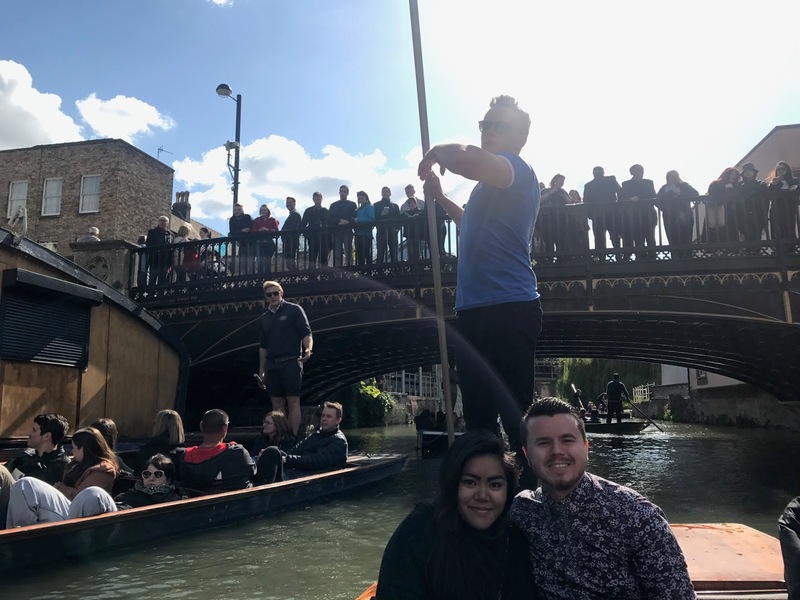 We were lucky enough to be given two spots on one of Let’s Go Punting guided tours, and it was fantastic! So relaxing, educational, and a great experience! You can read all about it here! Our time in Cambridge at this point was drawing to a close as we had a train back to London in the early evening. Looking for one last meal before departure, we chose to finally make use of the Groupon voucher for Afternoon Tea at Patisserie Valerie. It was just £19 for the two of us and it was pretty good! Again you can read all about it on our food blog here. Overall it was an absolutely fabulous couple of days, filled with sun, great food and learning all about the past and present of Cambridge. We’re not quite sure where our UK adventures will take us next, but we’re sure it won’t be too long before another post like this will be getting written! That’s it for now. Until next time! I love Loch Fyne! But then that's because I can never eat enough fish and seafood. I've never been to Cambridge but I hope to make it there one day. Looks like you had a fabulous time! By the sounds of it, I'll need to start planning a trip. It's absolutely gorgeous! Thanks for sharing your experience! Beautiful pictures (and food, of course) as usual! I've never been to Cambridge but it's a place I'd really like to visit!